So far my 2015 has been off to a great start when it comes to my pressed coin collection. It seems like every day since watching the ball drop in New York at midnight I keep receiving envelopes in the mail with coins waiting for me. Today I received one of my most anticipated coins each year. In previous posts I have mentioned that I am an active member in The Elongated Collectors (TEC). For those of you that are pressed coin collected but are not a currently members of TEC, you simply must join. I have been a member since 2010 and wish I had found out about this great club sooner. The wealth of knowledge from the members is amazing. Anything you want to know about the history of elongated coins, or how to create your own designs, tricks of the trade, or just trying to find some great people with a similar interest in the hobby this is the club to be a part of. As a member of the club you get a quarterly newsletters filled with great information and articles from other members about any number of topics including my favorite “personal coin pressing trips”. Included with the newsletters are always some unique pressed coins that in most cases you can only get by being a member. About a year or so ago I started trying to save some trees and help the club save on postage by requesting the digital version of the newsletter which arrives in my email as soon as it’s available each month. Then usually a few days later my special coins arrive in the mail and that is exactly what showed up today. The coin that I really wanted to show off was the 2015 Membership coin. 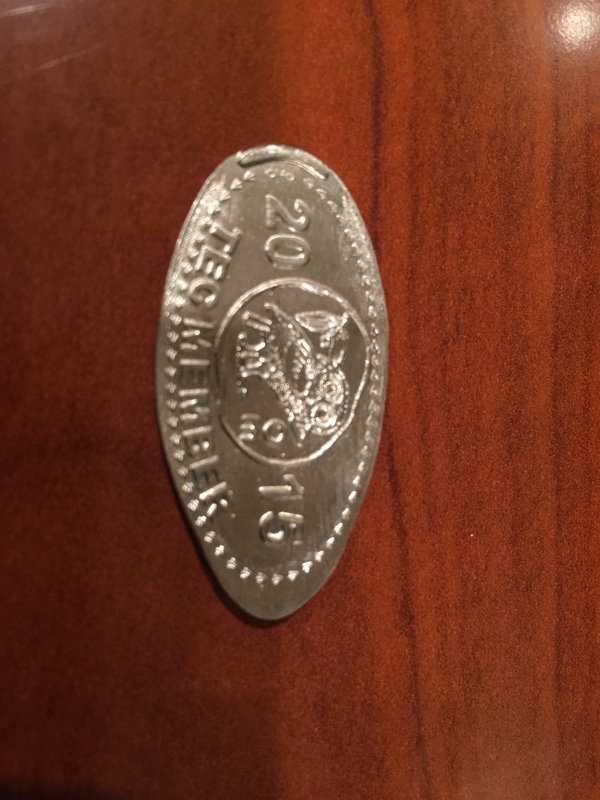 Each year a new design is created and pressed on a nickel. I have a special binder in my collection just for these membership coins as I like to keep them all together. Hopefully TEC won’t mind me showing this coin off as I’m really proud to display it and thought by letting you check it out it may help you decide to become a member. If your interested in learning more about TEC please check out the website www.tecnews.org. You can even fill out a membership form directly on the website. There is a small membership fee but this does include the newsletters, coins and you also help support a great organization. Feel free to list that you were referred by TEC Member #4237. This won’t get you any special treatment (sorry) but TEC always likes to keep track of how all the members find out about the club. As the old American Express commercials used to say “Membership has its rewards”. This is certainly true of TEC.